We are honored that you choose to enjoy our places and that you opt to hear from us. If you don’t want to get updates, please email us at qwrhinfo@qwrh.com. Conversely, if you wish to receive more frequent news, please sign up on any of our websites. We love feedback: Please let us know how your experience was while dining or during your stay by emailing us at qwrhinfo@qwrh.com, and/or if the spirit moves you to share some good stuff, please consider putting it on tripadvisor.com. If we could have done something better, please let us know directly at qwrhinfo@qwrh.com. Our upcoming Harvest Gathering at Proximity Hotel September 30 through October 2 is a weekend experience for guests to enjoy great food and captivating speakers in the sustainable food movement. Join us, along with Guilford College and Our State magazine, for what is sure to be a fun and thought-provoking weekend. 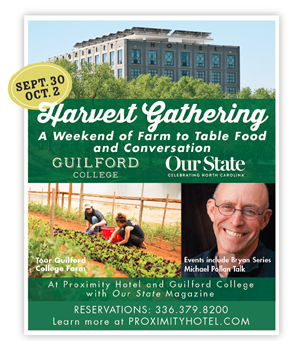 Attend the Bryan Series talk by award-winning author Michael Pollan and hear a special announcement about an exciting new development in sustainable food systems by Guilford College President Jane Fernandes. To reserve, please call our Reservations Department at 336-478-9105, Monday-Friday, 8 AM – 6 PM, and Saturday, 10 AM – 4 PM. 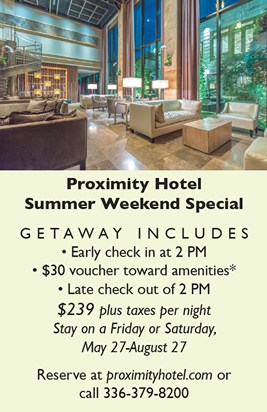 Learn more about the weekend and our round table experts at proximityhotel.com. Chef Felicia McMillan and Chef Leigh Hesling get to explore the Piedmont each week foraging for locally grown food to incorporate into our full menus and features. With their discoveries, they also create bespoke event menus for weddings and special events at O.Henry and Proximity Hotels, daily side specials at Lucky 32 Southern Kitchen and locavore specials at Print Works Bistro. They meet some pretty fascinating regional growers, talk with lovers of good food and learn about the people and places growing quality food in our region. They get to play every day in the kitchen with the ingredients they find, and often they can use these local ingredients to create some pretty fantastic flavors that reflect the fabric of our cultural region. Read on for more about a few of the chefs’ interesting farm friends. Inter-Faith Food Shuttle Teaching Farm: Just down the street from Lucky’s in Cary, this food shuttle is a community farming effort dedicated to creating a hunger-free community. Our Lucky’s staff volunteer in the garden, weeding beds and planting broccoli and more. We buy it, cook it and serve it to our guests. Pretty neat!! Learn how you can volunteer, too, at foodshuttle.org. Our “Friendly Neighborhood” is a pretty cool place, so we cooked up a few of our top self-guided tours when you stay at O.Henry and Proximity Hotels. Find more things to do at ohenryhotel.com and proximityhotel.com. Choose your favorite tour or mix and match. Read on for some of our top picks. Green Valley Grill offers extraordinary Mediterranean flavors, a welcoming bar with classic cocktails and garden dining. Summertime features include strawberries, peaches, greens and more. GVG serves lunch, dinner, late night and Sunday brunch. To see our full menus and make reservations, visit greenvalleygrill.com or call 336-854-2015. Print Works Bistro offers vibrant European bistro flavors, an energetic bar with craft cocktails and creekside terrace dining. Summertime features include tomatoes, sweet corn, basil and more. PWB serves breakfast, lunch, dinner, late night and weekend brunch. 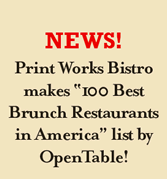 To see our full menus and make reservations, visit printworksbistro.com or call 336-379-0699. 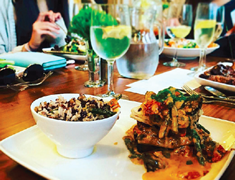 Lucky 32 Southern Kitchen Greensboro, just a stone’s throw away from O.Henry and Proximity, offers classic and modern Southern dishes in an upscale joint. (You can take a short walk to Lucky’s or take advantage of complimentary transportation to any of our restaurants.) To see our full menus and make reservations, visit lucky32.com, or call L32 in Greensboro at 336-370-0707. Skillet-Fried Chicken: At Greensboro Lucky 32, our Skillet-Fried Chicken special is every Sunday starting at 3 PM, just after we quit serving brunch. It’s a popular Sunday supper spot. (At Lucky’s in Cary we serve it up every Wednesday starting at 4 PM.) We’ll dish up this popular favorite ‘til we run out! Afternoon Tea: Taking tea in the O.Henry Hotel Social Lobby has become a local tradition. Hours: Friday, Saturday and Sunday, Noon—5 PM and Monday—Thursday, 2—5 PM. Reservations are recommended; please call Green Valley Grill at 336-854-2015. Don’t miss Australian-born Chef Leigh Hesling’s family recipe for traditional Lamingtons. 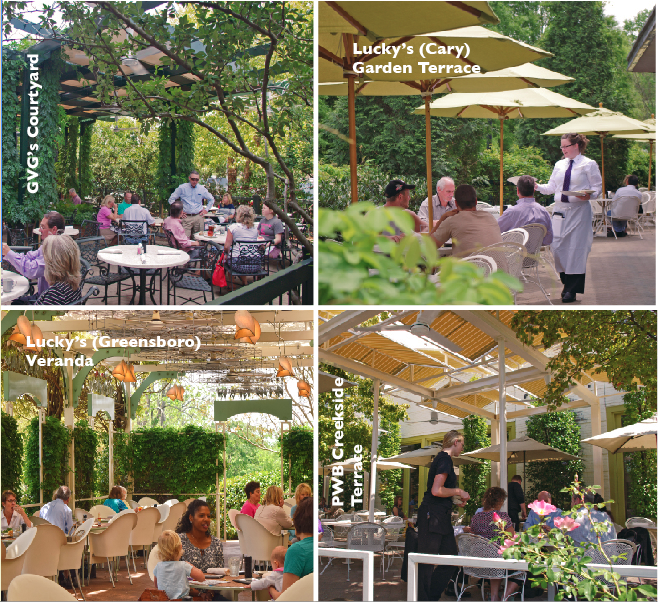 Or…Ask for our NeighborhoodQ self-guided tour list of choice spots around Greensboro. Our list includes some local gems you might want to add to your Food + Drink tour, like a cone at Yum-Yum Ice Cream, orangeade at Brown-Gardiner Fountain or some “Que” from Stamey’s and more. Thursdays | O.Henry Hotel Lobby Cocktails & Jazz: Settle into this commodious lobby, listen to fantastic American Jazz, enjoy craft cocktails and nosh on Mediterranean tapas. Local legends Neill Clegg and Dave Fox perform with vocals by a rotating group of their talented friends. Thursdays from 5:30-8:30 PM. Visit ohenryhotel.com/jazz.htm to see the schedule and menu and to learn more about the artists. Parks, Lakes, Trails and Greenways Tour – Our neighborhood parks offer lots of space to spread out and wiggle your toes in the grass. They’re perfect for picnics, running, mountain biking, strolling and cycling. The nearby Arboretum, Bog Garden and Tanger Family Bicentennial Gardens are a short walk from our hotels. You can check out complimentary bikes from either hotel and explore 90-plus miles of trails and greenways. Lake Brandt is a very short drive from the hotels and offers rentable boats, kayaks, canoes and stand-up paddle boards. Neighborhoods Tour – Just a short distance from our hotels are three of our favorite historic neighborhoods: Fisher Park, Irving Park and Sunset Hills. Walk, bike or take a drive where you’ll discover beautiful Southern homes and gardens. 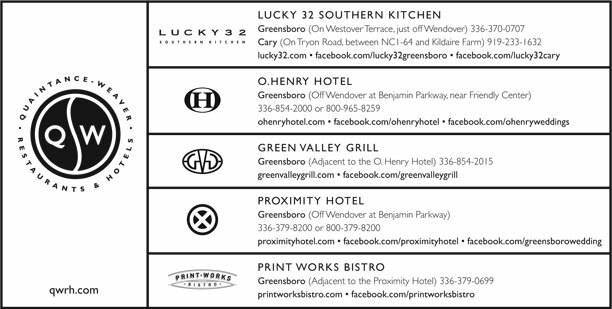 * Vouchers toward amenities can be used at Print Works Bistro, Green Valley Grill and Lucky 32 Southern Kitchen and other hotel amenities. Eastern Music Festival Package at O.Henry Hotel: Now in its 55th year, Eastern Music Festival presents their summer performance festival and educational institution. Our EMF Package includes a $30 credit toward a pre-concert dinner at Green Valley Grill and a Southern-style breakfast buffet with a late checkout of 2 PM. $239 plus tax. Package available during the EMF season, June 25-July 30. See the full schedule and get concert tickets by visiting easternmusicfestival.org. Tuesdays | Lucky 32 GSO: Songs from a Southern Kitchen: Laurelyn Dossett, Molly McGinn, Martha Bassett or another impressive musician lights up the bar on Tuesdays from 6-9 PM. Plus, value-priced wines and seasonal Southern snack options are on offer. What’s not to like? Performance schedule at lucky32.com. No cover charge! Wednesdays | Print Works Bistro: Mussels-Wine-Music:Rock out to fantastic covers and original lively music by AM rOdeO (Evan Olson and Jessica Mashburn). Also, enjoy delicious mussels (more for less, with our hand-cut fries) and six bottles of wines from $10 to $15 each. Wednesdays from 7-10 PM. No cover charge! Thursdays | O.Henry Hotel Lobby Cocktails & Jazz: Settle into the O.Henry’s commodious lobby, listen to fantastic American SongbookJazz, enjoy classic craft cocktails and nosh on seasonal Mediterranean tapas. Local legends Neill Clegg and Dave Fox perform with vocals by a rotating group of their talented friends. Thursdays from 5:30-8:30 PM. To see the performance schedule, visit ohenryhotel.com/jazz.htm. No cover charge! Select Saturdays | O.Henry Hotel Jazz Series: Cocktails and Jazz at the O.Henry is so much fun that we asked the amazing Victoria and Neill Clegg to curate an expansion of the O.Henry Jazz scene. 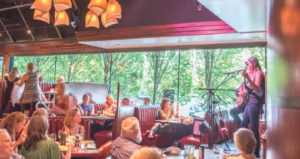 On select Saturdays you can enjoy vintage craft cocktails and delightful seasonal tapas along with an eclectic array of jazz artists performing in the varied styles of contemporary jazz. Select Saturdays from 6:30-9:30 PM. For an up-to-date performance schedule and to learn more about the artists, visit ohenryhotel.com/jazz.htm. No cover charge! Arrive early for a seat! O.Henry Jazz Series Package: O.Henry has become quite a hotbed for jazz, and we’re thrilled to be a part of this extraordinary world-class local jazz community! 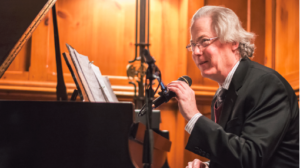 Take advantage of our O.Henry Jazz Series Package, which includes one night’s gracious accommodations, preferred seating at our O.Henry jazz performances, $30 amenity voucher, a Southern-style breakfast for two and a late checkout. $279 plus tax and gratuities. 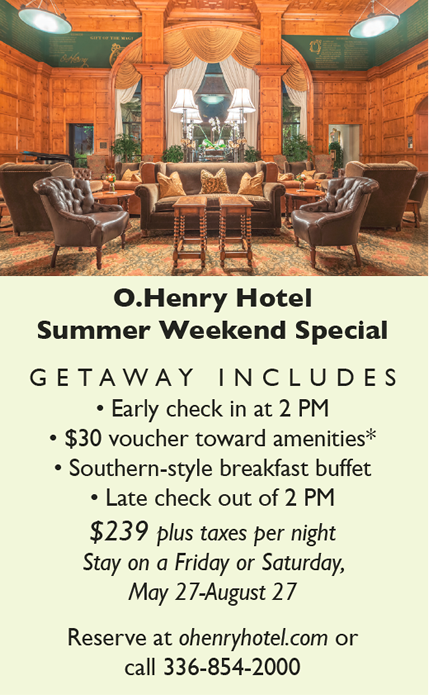 For a list of package dates, visit ohenryhotel.com/jazz.htm; book online at ohenryhotel.com or call 336-854-2000. It would be a great favor if you referred folk who might enjoy playing restaurant and/or hotel with us. We are looking for friendly, competent people who will join us in being of genuine service to our guests and colleagues. From entry-level jobs to leadership roles, we need even more energetic and enthusiastic people. See our current openings online and check back often. Apply online by visiting qwrh.com/jobopenings.htm. A Green Valley Grill recipe. Get more recipes at greenvalleygrill.com. 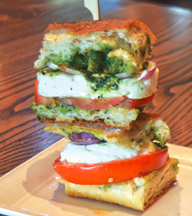 *Get our Fresh Basil Pesto recipe at greenvalleygrill.com. For more delicious recipes from our kitchens, visit lucky32.com, lucky32southernkitchen.com, and printworksbistro.com.